Third party risk management is constantly evolving. With changes usually comes adjustments in best practices to minimize risk. Doing these 24 best practices will help ensure your organization and team is a top performer in vendor risk management and in business overall. 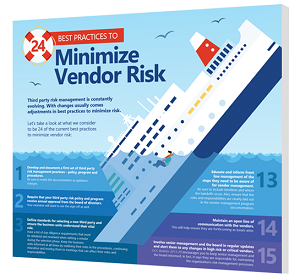 Download the infographic now and take a look at what we consider to be 24 of the current best practices to minimize vendor risk.